“Juan Rodriguez, first merchant and non-Native American resident of Manhattan Island in 1613.” Watercolor by Charles Lilly, Schomburg Center for Research in Black Culture. In 1609 the English explorer Henry Hudson discovered the river that now carries his name. Today we make a major hullaballoo around this alleged “first European contact”, but back then there was little interest – even from those who’d sent him. 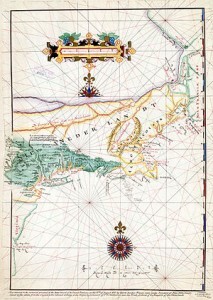 However, the rough map of the lower river Hudson provided his Dutch masters was passed along to other traders. One company, the van Tweehuysen syndicate, was keen to get a foothold in the burgeoning fur trade; it sent out skipper Hendrick Christiaensen to investigate in 1611. Upon arrival, the wary captain anchored away from the unfamiliar coast, and made sorties ashore. During one of these he kidnapped two boys from a local Lenape village. Christiansen felt the two boys – he renamed them Orson and Valentine – would generate public interest upon his return to Amsterdam. This was the same sort of calculated publicity stunt that echoed Columbus and pre-dated John Rolfe’s promotional promenade of Pocahontas by five years. Unfortunately for Christiaensen, the publicity meant his new highly profitable source of furs was now an open secret. The next spring, a Dutch merchant working for the same company, Adriane Block, returned to map the area in order to establish a permanent trading post. Block and the van Tweehuysen company enjoyed two months of uninterrupted trade. Then when he was preparing for the return journey to Amsterdam in the late summer another Dutch ship, captained by Thijs Mossel, arrived in the Hudson Bay via Santo Domingo, the biggest port in Spanish Hispaniola – the island we now know as the Dominican Republic and Haiti. Taking up residence on shore is what cements Rodriguez’ place in the history books. Previously, the Dutch had stuck to the security and relative comfort of their anchored vessels. Rodriguez decided to set up shop and trade the goods he’d received from Mossel to the local tribes. His plan obviously worked, because when Block, Mossel and Christiaensen returned, not only had Rodriguez survived the winter – he’d established a business relationship with the Lenape. 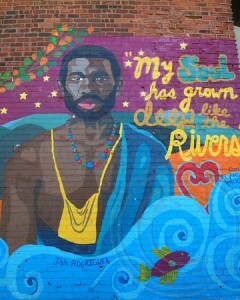 Detail from the mural “Harlem River,” copyright 2009 Creative Art Works. All rights reserved. Rodriguez approached Christiaensen and proposed a collaboration, to which the latter agreed. When Mossel did return, he was publicly furious that Rodriguez had double-crossed him. 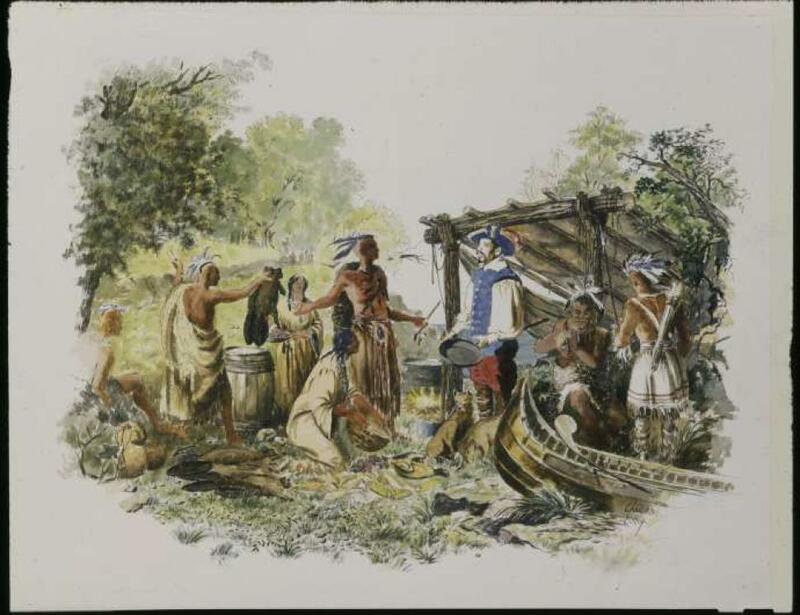 Towards the end of April 1613, when a canoe of Lenape paddled out to meet Christiaensen’s ship to trade, Mossel’s crew fired on the canoe and then rammed it with their boat, forcing the natives to seek refuge on Christiaensen’s sloop. Mossel’s crew then turned their attention to Juan Rodriguez. Seeing them approachwith possibly murderous intent, Rodriguez fired a shot from his musket but was overwhelmed by four crew members, who took his musket and attempted to arrest him. Rodriguez grabbed a sword from one and fought his way back to the sloop and the protection of Christiaensen’s crew. Mossel’s crew withdrew in frustration whilst hurling a series of racist epithets, the more offensive of which the court records of 1614 refused to repeat. That was the last record of Rodriguez that we have. He seems to have avoided the Dutch for the rest of his life. But regardless of his fate, in those few months Rodriguez not only became the first immigrant to move to New York, but also the first African, the first Latino, the first resident of European descent, the first Dominican, the first business owner and the first black man to be arrested in New York by white men. He anticipated, in a single persona, the diversity of New York. Rodriguez’ legacy is remembered with a plaque and mural in Riverside Park on the Upper West Side. 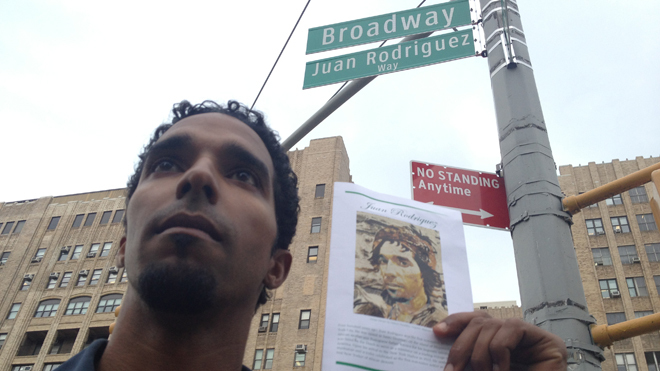 In 2012 on the 400th anniversary of his move to Manhattan, the city co-named a 59-block-long stretch of Broadway starting in Washington Heights as Juan Rodriguez Way, an important tribute to the historic status and recognition of the substantial local Dominican community. What of the rival merchants; the fledgling Dutch trade and the two kidnapped Lenape boys? Christiaensen headed further up the Hudson and built a fort for protection during the winter, which he named Fort Nassau. Block returned to the area a couple of weeks later and threatened to sink Mossel. The two remaining factions were so busy arguing that they failed to notice a fire had mysteriously broken out on Block’s heavily-armed ship, which promptly sank. (This had more than a whiff of suspicion about it, but Block never accused Mossel directly.) Amazingly, the soggy remains of Block’s ship were discovered centuries later by workers excavating the foundations for the World Trade Center. Several of Block’s crew mutinied and captured Mossel’s ship. Just as Mossel had claimed to have nothing to do with the fire that destroyed Block’s ship, Block expressed surprise and protested his innocence in the capture of Mossel’s ship. The mutineers set off for the West Indies in Mossel’s ship, leaving the Dutch merchants to face a winter in New York. The fact that they left him behind with Mossel seems to confirm Block’s version of events. 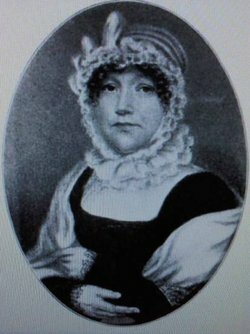 Mossel and Block were eventually picked up and returned to the Netherlands, where they promptly started mutual litigation. 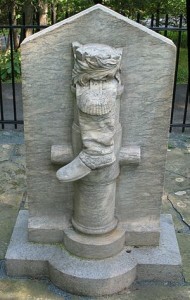 Block came off the worst, eventually being forced to pay for the loss of the 6 valuable cannon that sank with his ship. Whilst they were in court arguing, the Dutch government granted the exclusive trading rights to group of merchants who referred to themselves as The New Netherland Company. For the next 60 years, many Dutch colonists would follow in Rodriguez’ footsteps. The harshest fate befell Christiaensen: he continued to travel and trade with the two kidnapped Lenape boys, Orson and Valentine, using them either as translators or a warning to others. In 1616, on a return trip to Fort Nassau, Orson finally got his revenge and murdered his publicity-hungry Dutch captor. Mossel paid him “eighty hatchets, some knives, a musket, and a sword” which seems unusually generous. As Hart notes, “Later it appeared that this payment also included an advance on services still to be rendered” which begs the question: Was Rodriguez still working for Mossel? Mossel’s behaviour upon his return (outrage and the arrest attempt when he discovered Rodriguez was working for Christiaensen) would seem to confirm this. Jamie H. Lewis was raised in a museum. 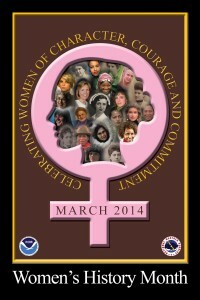 He teaches, writes for various historic publications including the Museums Journal and The 28th. He knows he needs to get out more. Hart, Simon. “The Prehistory of the New Netherland Company.” Amsterdam, City of Amsterdam Press, 1959. This entry was posted in Uncategorized on August 6, 2014 by Joshua Simons. 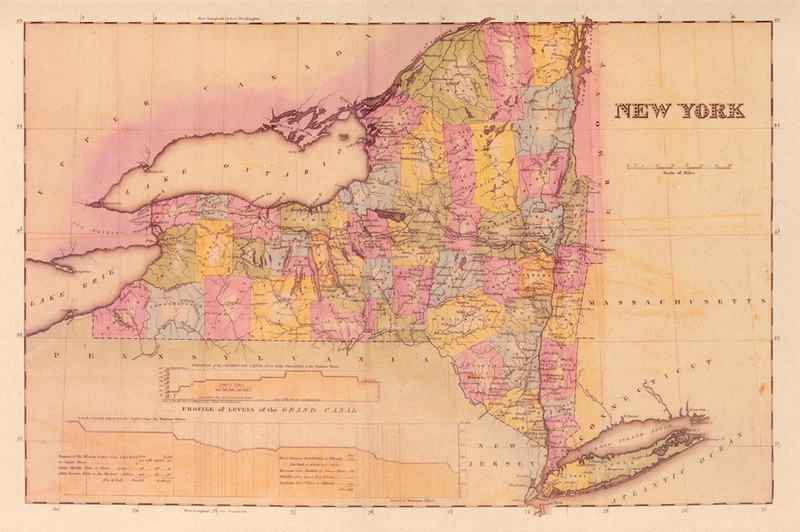 In my last blog, I argued for an integrated narrative of New York State history, one that incorporates rather than isolates both the peoples of New York and the regions from which they hail. The Civil War, though not fought on New York’s soil, was a cataclysmic event that united the state and its diverse population in a conflict that was both external and internal. From all corners of New York, volunteers and draftees formed into companies, battalions, regiments, brigades, divisions, corps, and finally armies. At the same time, civilians, men and women, turned their energies to supporting the war effort and the troops through both industry and voluntary efforts. Finally, politicians and citizens within the state disagreed about the necessity for the war itself, the conduct of the campaigns, the appropriate war aims, and who should serve. 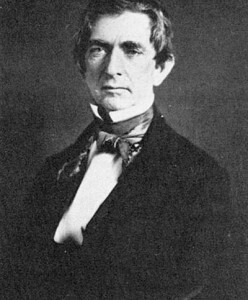 Seward was a major figure in United States history, but I suspect that for most New Yorkers he is better-known as a member of Lincoln’s cabinet and later promoter of the acquisition of Alaska than as a New Yorker. Although his words clearly echo Lincoln’s points in the far more famous “House Divided” speech of June 1858, using Seward’s quote to open the exhibit and name it put New York – quite properly – at the center of the national debate over slavery. Displays featuring Gerritt Smith, John Brown and Frederick Douglass connected New York to the national debate and sectional crisis. Most interesting was the discussion of Smith’s economic, social and political experiment, Timbuctoo (1846-53), in which he offered 120,000 acres of his own land far upstate, in Franklin and Essex counties, to 3,000 men of African descent, divided into 40-acre parcels. Smith hoped that turning these individuals into land-owning farmers would increase the African American vote in New York; the state constitution of the time required that black men own at least $250 worth of property, although there was no such requirement for white voters. Smith’s experiment brought the fervent abolitionist John Brown to North Elba, where he purchased a 200-acre farm from Smith with the goal of assisting the black families – and is the reason why Brown was later buried at North Elba. The exhibit also pictured less-noted New York abolitionists, among them Abigail Mott, a Quaker businesswoman from Albany, active in the underground railroad. 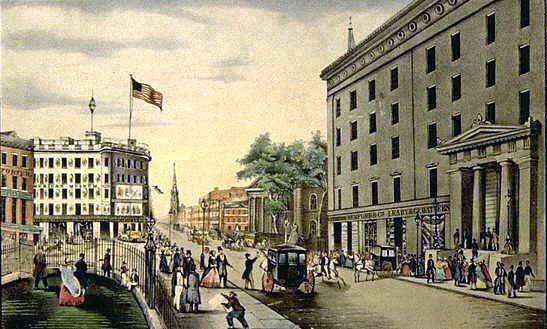 Once war was declared in 1861, New York State provided the most soldiers and raised the most money of any state in the union. 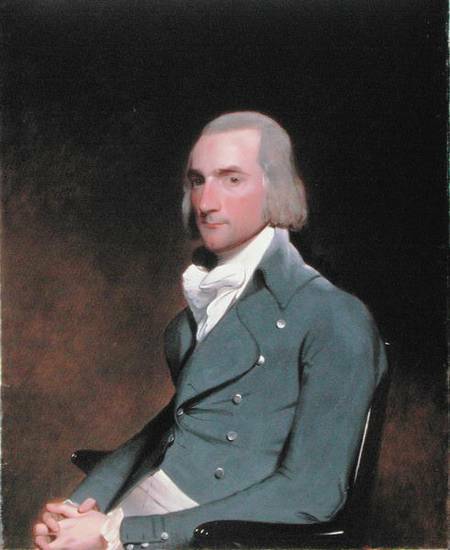 New York banks made loans to both the states and federal government; citizens across the state paid an income tax and added millions in private donations. The exhibit highlighted contributions of New York industry, such as Erastus Corning’s ironworks and railroads, and the West Point Foundry in Cold Spring. 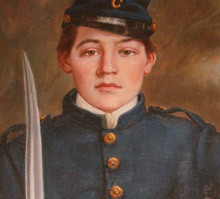 Who knew that the first martyr of the Civil War was New Yorker Elmer Ellsworth, who was shot on May 23, 1861 while cutting down a Confederate flag on an inn in Arlington, Virginia, or that the first hero was Francis Brownell of Troy, who then avenged Ellsworth’s death by killing his killer (the innkeeper)? Born in Malta, New York, Ellsworth had moved to Illinois, but returned to New York State to raise a regiment for the war. Although original enlistments were for 90 days only (!) many volunteers re-enlisted for three years. 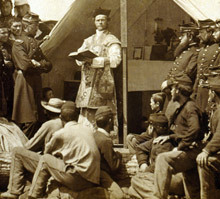 Materials illustrating the diversity of troops included the papers of one William Kenney, identified as Iroquois member of the “Tuscarora Company,” who was captured in North Carolina, and later died in Andersonville prison in 1864, as well as a photograph of a Roman Catholic mass held for the largely Irish 69th New York in 1861. Other volunteers associated with particular locations or ethnic groups included Max Weber’s German Turner Rifle Regiment, and the 14th Brooklyn called “red-legged devils” by Stonewall Jackson after four charges at First Bull Run. That the war created unlikely allies can be illustrated by contrasting the Irish and German volunteers to the 71st Infantry “American Guard,” whose Know-Nothing roots dated to its founding as part of the National Guard in 1850. Coverage of ordinary soldiers was balanced by portraits and short biographies of the state’s most noteworthy leaders. 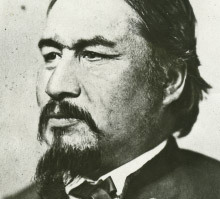 One of the last portraits was that of Ely S. Parker, the Seneca chief, lawyer, and engineer who became Grant’s aide and was not only present at Appomattax, but was responsible for writing out the terms of the Confederate surrender. The exhibit also featured displays on less celebrated aspects of New York and the Civil War, including the New York City Draft Riots and the Elmira Prison Camp. In the case of the prisoner of war camp, however, the accompanying objects and images did not quite convey the grisly details of that chapter of New York history. Lacking adequate food, shelter, clothing, sanitation, and medical care, almost 25% of the Elmira inmates died in the single year of its operation — uncomfortably close to the 29% who died at the notorious Andersonville prison in Georgia. The exhibit text reported these statistics next to a photograph of camp buildings. 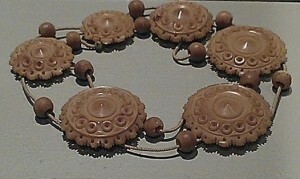 Offsetting this grim picture, a nearby case featured intricate jewelry made by the prisoners – blandly describing them as having “idle time on their hands.” However, scholars have found that such items were made not simply to pass the time, but instead to trade with the guards, who then resold the trinkets those outside the camp. This prison “industry” assisted Confederates in making extra money for needed supplies not provided by the U.S. government. My disappointment in the exhibit’s coverage of the Elmira Prison Camp is a minor point. Overall, this was an outstanding and effective effort and, I hope, a model for the way major historical events can be used to tell the story of the whole state and its peoples. Although the exhibit itself closed in late March, it lives on in digital form on the New York State Museum’s website (see link below). Michael Horrigan, Elmira, Death Camp of the North (Stackpole Books, 2002), p. 180. This entry was posted in Uncategorized on June 16, 2014 by Joshua Simons. Arnold was not only the hero of the Battle of Saratoga in 1777—the pivotal battle of the war—but also contributed to the U.S. victory over Great Britain through (1) the capture of Fort Ticonderoga in 1775, (2) the building of the first navy and the Battle of Valcour Island in 1776, and (3) lifting the siege on Fort Stanwix and thus driving one prong of the British invasion back to Niagara in 1777. 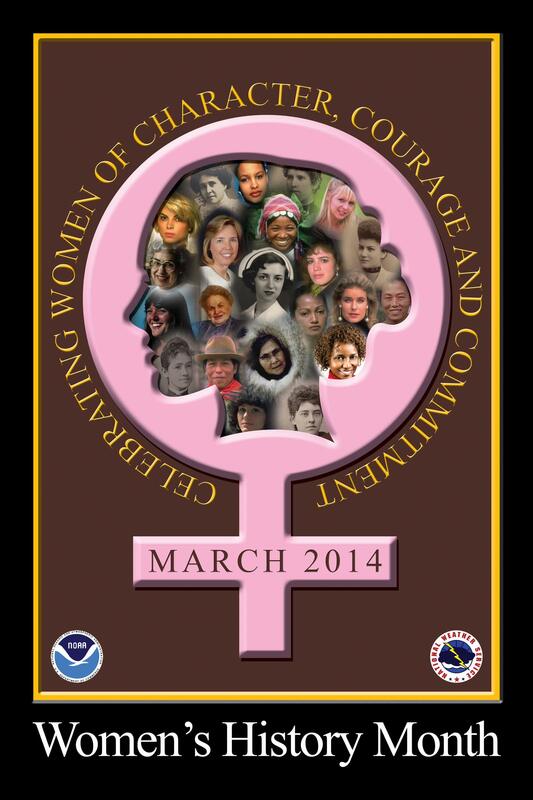 In addition, Arnold’s military career was noteworthy for numerous acts of ingenuity and courage. This entry was posted in Uncategorized on October 17, 2013 by Susan Lewis. We live in the midst of New York stories, and create new ones every day. They are all around us. The sum of these stories, some familiar, some virtually forgotten, make up the history of our state. 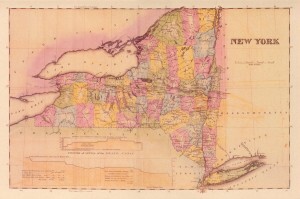 As a center of innovation, enterprise, diversity, interconnections, conflicts and leadership, New York State both reflects the entire history of the United States and provides its own special flavor to the American narrative. New Yorkers have been accused of neglecting their past to focus on the future. Yet the college students who study Empire State history with me are not only excited to learn about the state in which they live, but frustrated when they realize how much they were never before taught. 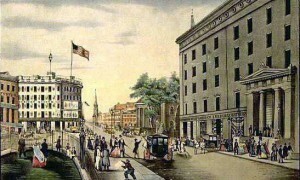 So, as I wrap up my research and begin writing a new college textbook on the history of New York State, I set out in this blog to share with a wider audience some of the discoveries I have made along the way as I’ve researched New York’s stories. It will feature snippets of history that I find intriguing — vignettes from the Big Apple and the boroughs, Long Island, the Hudson Valley, Capital District, North Country, Southern Tier, Finger Lakes, the Niagara Frontier – and anywhere in between. Although these stories may not be news to all of you, they will be surprising to some, and will jog the memories of others. Read and enjoy. 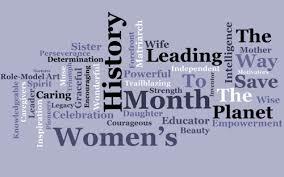 And, if you have any comments or corrections, please share them with me. This entry was posted in Uncategorized on September 17, 2013 by Susan Lewis.